The most arresting feature of Windekind, once the home of Van 't Sant, adjutant to Queen Wilhelmina, is its extended roof overhangs. 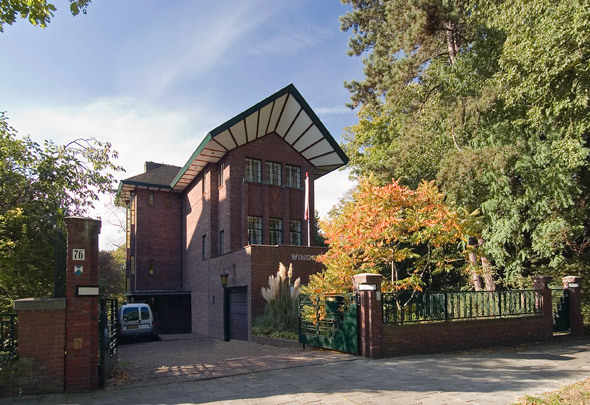 The long narrow volume boasts a freestanding monumental staircase of fair-face brick with which Roosenburg acknowledges a debt to his teacher Berlage. The ground floor contains the dining room and servants' quarters and the second floor the bedrooms; the first floor is a single large articulated living space. A summerhouse, a miniature replica of the residence, stands in the garden along the water.